You can count on Coastal Valley Dermatology Associates in Carmel, CA to achieve the best possible results for hair laser removal. We offer the highest grade of laser hair removal technology that is available. 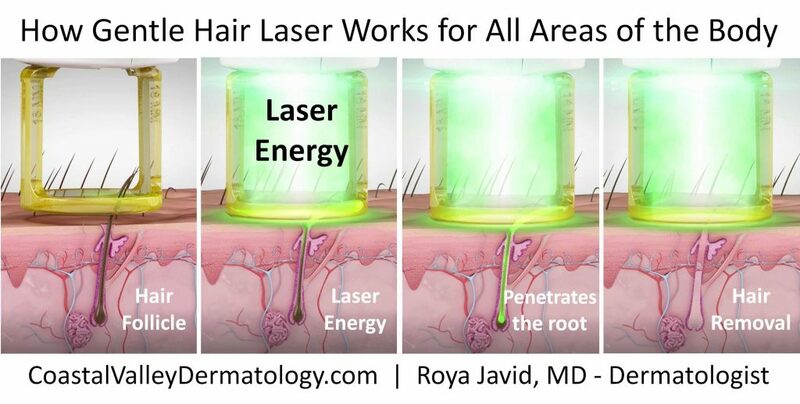 Hair laser can remove hair from all parts of your body including upper lip, underarms, cheeks, arms, legs and back. Why should you consider getting hair laser removal? We all wish we can have more time in a day. Imagine not having to spend extra time to get ready in the mornings because you can kiss the hassle of shaving and tweezing goodbye! You can have the freedom to wear whatever you want and whenever you want because you don’t have to deal with any embarrassing unwanted hair. Is it important where I go for my laser hair removal? Definitely! Dr. Javid is an experienced dermatologist and she always tries out the laser first on herself before offering it to her patients. Getting hair laser treatments at medspas performed by technicians without doctor supervision can be risky because hair laser can cause scarring and hyperpigmentation when not done correctly. Make sure the technician is trained adequately to perform hair laser for your skin type and color. How much do hair laser treatments cost? Treatment cost depends on the area being treated. Our hair laser pricing is extremely competitive and it’s performed at a dermatology office where your safety is our priority. Join our yearly membership to receive 50% off all hair laser treatment areas. 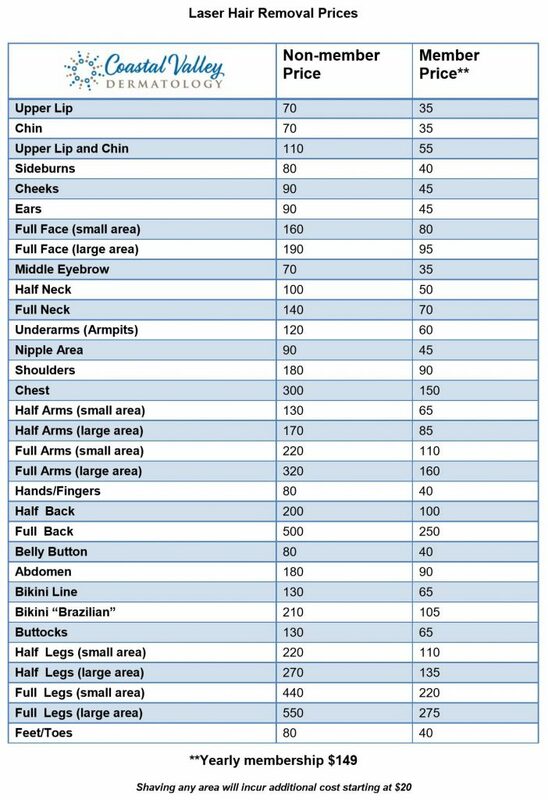 How many hair laser treatments do I need? You will need more than one treatment. Hair growth is reduced after each hair laser treatment and the frequency of hair laser treatment depends on your hair color, skin type and tone, and body area. Other factors include hair density, ethnicity, medication age, and your own hair growth cycle. What does hair laser treatment feel like? The GentleLase Pro hair laser system uses a patented Dynamic Cooling Device™which prepares the skin for treatment by spraying the upper layers with a cooling burst of cryogen in adjustable durations, milliseconds before and after each laser pulse. The specialized cooling burst helps ensure that hair laser treatments are as comfortable as they are effective. Patients have described that a hair laser treatment feels like a light snap of a rubber band with an immediate cooling spray. During treatment, the laser delivers a brief, intense beam of light which is absorbed by the hair follicle and converted to heat. The heat damages the hair follicle, specifically around the bulb and bulge preventing further hair growth. The surrounding tissue remains unaffected and unharmed. Any preparations needed before hair laser treatment? Try to limit sun exposure before getting your hair laser treatment. Do not bleach, pluck or wax hair before and after treatments. Please wait for tanned skin to fade before beginning hair laser treatment. Any precautions after hair laser treatment? Your skin may be slightly pink or red immediately following the hair laser procedure for a few minutes to several hours. You may return to normal activities after treatment. Limit your sun exposure to the treated areas. Please use sunscreen over the treated areas that are exposed to the sun. Why is winter the best time to get hair laser treatments? Laser treatments and the sun aren’t always a good mix. This is why the winter season is an ideal time to consider laser hair removal. Not only can the harsh summer sun decrease the effectiveness of your laser hair removal treatments, the damaging rays can increase the likelihood of serious side effects, like scarring and blisters. And since we bundle up in the winter with long pants and warm coats, it’s an easy time to shield your laser treated skin from the sun. 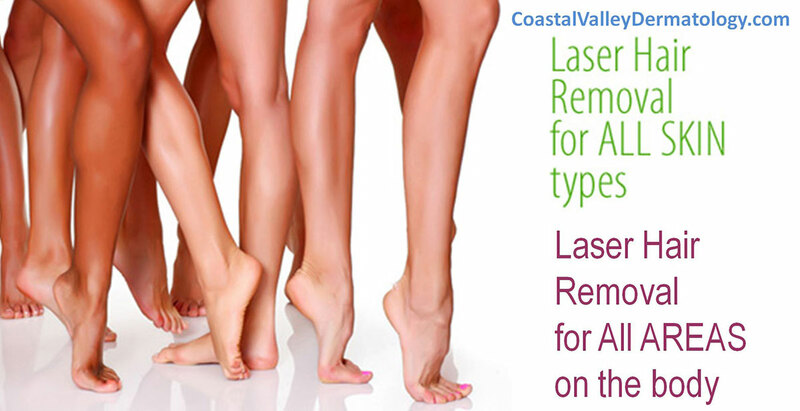 Coastal Valley Dermatology offers GENTLE hair removal, the laser treatment that is safe and effective for all skin types. Gentle delivers powerful results, and with its patented, revolutionary Dynamic Cooling Device and super fast treatment times, it’s the most comfortable laser hair removal available.